My circulation isn't what it used to be and I find that my legs get tired pretty quickly if I have to stand (or sit) for long periods of time. I'm always looking for the magic bullet, but sadly I don't think it exists. This gel does address the aches and discomfort and it reminds me of the cooling lotions I buy for muscle injuries. The menthol vapours after application are also reminiscent. The ingredients are also similar: extracts of Arnica, Peppermint, Horse Chestnut, Witch Hazel; mostly astringents, but the addition of Argan Oil facilitates a short massage and leaves my skin silky smooth. Shortly after application, the peppermint kicks in and there is a noticeable and persistent cooling sensation, like a gentle, prolonged ice pack. Hot, tired legs instantly feel refreshed and the cold therapy is accompanied by a pain relieving effect. Wonderful! Together with the tube of gel (100 ml, a reasonable size), there is a small gel pack to keep refrigerated for an instant shot of cold. It can easily be wrapped round an ankle with the attached Velcro strap and if you repeat your purchase, you will have one for each leg. A welcome little extra, but I think a slightly bigger pack would be even better. Aside from this minor criticism, I really love Cool Legs. The price is very affordable and the effect wonderfully soothing. A light body oil that absorbs very quickly into my skin. The dark brown glass bottle contains 100 ml which lasted me nearly four weeks. Obviously this depends on how much one uses and how often, but I find it quite satisfactory for the price. I have been using this primarily on my legs and arms and can get dressed quite quickly thereafter without worrying about residue. It agrees with my skin and has kept it very smooth and hydrated in winter, when dry and flaky skin is often a problem. The base is sweet almond oil and argan oil with the addition of some of the most effective essential oils specifically to improve circulation, and to tone and regenerate the skin (rosemary, geranium, jasmine and peppermint). The one that seems most prominent to my nose is the rosemary with perhaps jasmine a close second, so the scent is very herbal and lemony, almost sharp. Usually the perfume lingers on my hands and I can't stop sniffing it, it's quite compelling. The recommendation is to apply it to damp skin, so it's a natural to apply after a bath or shower. I have seen this advice before, the oil helps lock and drive moisture deep into the skin. The texture is very light compared to others I have tried, which is consistent with the pure essential oils listed. 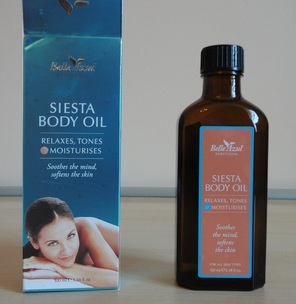 I prefer this type of body oil to the heavier kinds that never quite sink in. 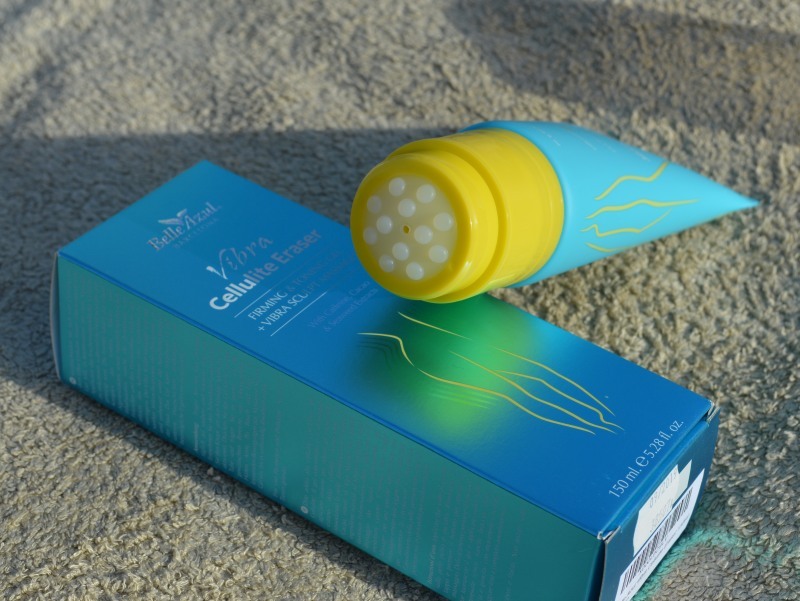 Like other Belle Azul products, it comes in a beautiful turquoise/sea green box that always makes me think of sunny holidays. For me controlling cellulite is a continual effort. I have tried a lot of products, some good, some quite useless. This past winter my cellulite seemed to get worse, especially when I had to stop my usual gym routine because of torn muscles. The worst part was my thighs and bottom. As I lost muscle tone, the skin started to sag and look really wrinkly above the knee. I started using this gel 3 weeks ago, once a day. Occasionally I have time to use it twice, but not often. After 2 weeks I could see an improvement, and now I'm pretty sure that it's helping. The toning effect is particularly good, and I think it's due in part to the massaging action of the applicator, and in part to the consistency of the gel which is very easy to spread and remains moist for long enough to allow a really good massage. The gel has a very fresh smell, herbal and lemony and it's made of natural ingredient that have worked for me before: extracts of caffeine, algae and cocoa. Also the product is not tested on animals. The applicator at the end of the tube is very convenient. It has raised bumps and a button on the side starts the vibrating action which is very gentle but effective in stimulating the circulation. Squeezing the tube places the gel exactly where the massaging head can reach it, no mess, and the product gets absorbed completely without leaving a residue. I'm very pleased with the improvement so far, and I still have some gel left. The tube holds 150 ml, which is standard for this type of product. I have added this to my list of “effective” cellulite busters.